Howdy, and welcome aboard. When you’re shopping for a riflescope, you want to make sure to get the best quality product that fits within your budget. There are quite a few scope manufacturers out there, and Leupold is very well known for producing some of the finest glass available. On this page, you’ll find out some of the most popular optics from Leupold, along with what to expect from its riflescopes. Read on for more information. Can I Get A Budget-Friendly Scope From Leupold? While most of Leupold’s scopes might seem like sizable investments, there are some that are softer on the pocketbook than others. One of my favorite Leupold optics, and one that is relatively easy on the bank account, is the VX–2 3–9x40mm riflescope. This glass offers super-fast focusing under any conditions, has a generous eye relief, and features blackened lens edges to reduce glare and diffusion through the perimeter of the sight picture. Unfortunately, it doesn’t offer an illuminated reticle or side parallax adjustment, and the windage and elevation controls don’t feature a zero reset option. 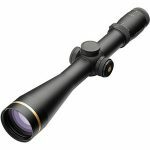 What’s The Best Scope Leupold Manufactures? The top of the line in Leupold’s catalog would have to be the VX–6HD 4–24x52mm CDS-ZL2 Side Focus riflescope. This particular optic offers more features than I can list here, but let’s just say that Leupold has thought of nearly everything in designing the scope. It even offers an internal electronic reticle level, making it easy to get your scope mounted properly. The FireDot illumination in the reticle will help you stay on target even in low-light conditions, and a press of a button allows you to dial up extra elevation, up to 40 MOA, when necessary. 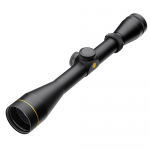 Unfortunately, even this scope isn’t perfect – the eye relief is a tad bit short at 3.7 inches and the glass is rather heavy, at a pound and seven ounces. Are There Any Red Dot Sights Made By This Company? For some purposes, a red dot sight is all you need. Leupold, in its efforts to provide shooting accessories for all purposes, does manufacture these in addition to its scopes. 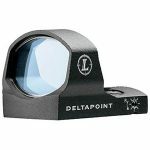 The DeltaPoint Reflex Sight offers precision red dot ease and accuracy for handguns, shotguns, AR variants, and even crossbows. The only real drawback to this sight is the limited elevation and windage adjustment range of 60 MOA. Does Leupold Build Its Own Scopes? A premier optics company, Leupold manufactures all of its own products, with all of its scopes being designed, machined, and assembled in the United States. In addition to manufacturing scopes, Leupold also produces spotting scopes, rangefinders, and other products, as well as offering a custom shop for those cases where you just can’t be satisfied with off-the-shelf optics. What Are Some Common Features Of Leupold’s Glass? The most prevalent characteristic of Leupold’s optics is the quality of the product. Every riflescope the company manufactures is covered by a full lifetime guarantee that the product will perform as promised forever (excluding electronic components). This warranty extends not only to the original purchaser of the glass, but also to any future owners, without the need for proof of ownership or a warranty card. While all of Leupold’s scopes are fogproof and waterproof, many of its products are even more so, since they feature Leupold’s proprietary second-generation argon/krypton gas blend instead of the usual practice of nitrogen-purging the optics chamber. How Good Are Leupold’s Optics? This is a company that devotes painstaking attention to its optics. Every Leupold scope features fully multicoated glass surfaces and utilizes only the best possible glass for the application. Leupold doesn’t cut corners in its design or engineering, or in its manufacturing processes. Instead, it continuously reviews those procedures to ensure the most innovative, cost-effective methods are being used for every aspect of producing the best-quality scopes a consumer could ask for. What Kind Of Reticles Does Leupold Use? A better question might be, “What kind of reticles doesn’t Leupold use,” because the company offers more than 70 options throughout its vast catalog of scopes. Many of these reticles are customized for specific types of ammunition, such as the 300 Blackout reticle that is designed specifically with the .300 AAC Blackout ammunition in mind. Are These Scopes Lightweight And Compact? Many of Leupold’s scopes are extremely compact and lightweight, but that isn’t always the case. In some instances, such a characteristic is simply impossible to achieve, especially when high levels of magnification are provided and/or the objective lens on the scope is quite large. 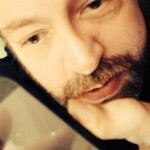 How Much Magnification Can I Expect? Within Leupold’s vast selection of scopes, you should be able to find almost any reasonable level of magnification you could ask for. Optics are available with 3:1 zoom ratios as well as 4:1, providing magnification up to and included 24X. Even with the highest zoom levels, Leupold’s scopes offer unparalleled color reproduction, clarity, contrast, and crispness. Do Leupold’s Scopes Do A Good Job Of Transmitting Light? With generous objective lenses and fully multicoated optics, almost every scope manufactured by Leupold offers excellent transmittance. On top of that, many of the optics are available with illuminated reticles, making the job of acquiring your target in low-light conditions not only easy, but fun, too. How Wide Is The Field Of View On These Optics? With Leupold’s glass, you will never have to worry about a limited field of view. In nearly every case, I’ve found the company’s scopes to offer a linear field of view that equaled or exceeded the industry average. Are Leupold’s Scopes Easy To Mount And Sight In? When you purchase a scope from Leupold, it usually will not come with scope rings. While most of the catalog utilizes one-inch maintubes, a handful of products feature 30mm maintubes instead, so be sure to pay attention to what you are buying. Leupold makes some of the best scope rings in the business, so strongly consider matching your scope with a set of rings from the same company. Once you have your scope mounted, which is usually an easy process, you can quickly get sighted in. Just start off with a laser bore-sighting tool, and then fine-tune your controls at the shooting range. As previously noted, Leupold offers a full lifetime guarantee on every scope it makes. This is because the company knows the scopes will stand the test of time and abuse. Thanks for reading my summary of Leupold’s riflescopes. These are fantastic products that will keep you shooting straight for years to come. They aren’t perfect, but they’re pretty close.